Look out for the Down Hill Strugglers with John Cohen (of the New Lost City Ramblers) appearing on Saturday, April 19th at 9:45pm at the Brooklyn Folk Festival. It's gonna be a great event! The whole festival takes place over the course of 3 days, April 18th - 20th and will feature 30 different bands, workshops, films screenings, a square dance and a banjo throwing contest called the "Banjo Toss." 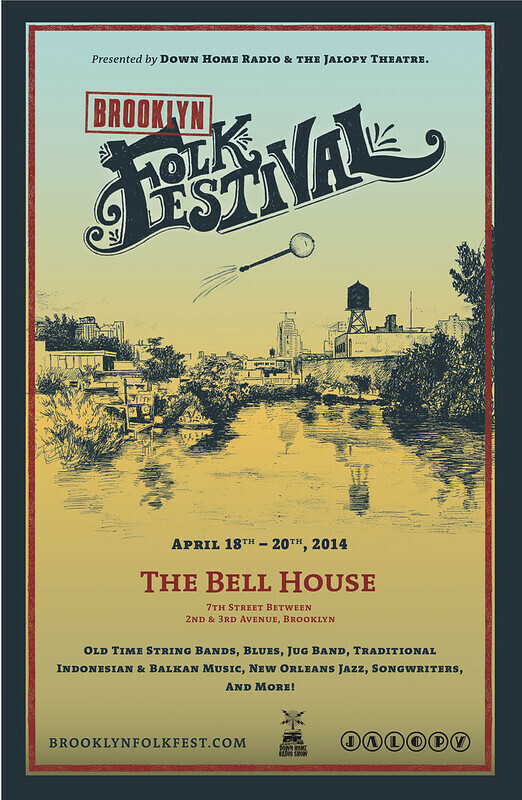 This year the festival prominently features Old Time string band music - including a number of our friends and very favorite performers from New York and all around the country. Including Frank Fairfield, Jerron "Blindboy" Paxton, Elizabeth LaPrelle and Anna Gevalt, the Stone Mountain Wobblers, Dom Flemons and Hubby Jenkins (of the Carolina Chocolate Drops), the Tillers, the Blueridge Entertainers, the Whiskey Spitters, Walker & Jay, the Drunken Catfish Ramblers, Nathan Godfrey and the East River String Band featuring R. Crumb. These are many of our favorite old time string bands in the world! Its quite a collection and gonna be a great festival. There will also be jug band music, Balkan, Andean and Indonesian music, songwriters, blues and a Pete Seeger tribute. Look out!